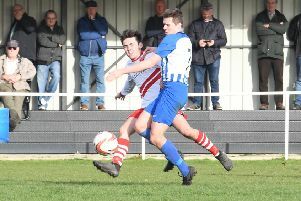 The away day blues continued for patched-up Skegness Town as they slipped to their third consecutive defeat on the road. This time it was AFC Emley, who they had beaten 3-0 at The Vertigo Stadium only a month before, who swept aside an injury-hit Lilywhites team. And for their third away game on the trot the seasiders failed to score. They looked likely to end that drought when they were awarded a penalty early in the second half, but Josh Morrall’s spot kick was saved by home keeper George Clarke. At that stage the Pewits were in front by virtue of a penalty of their own. James Lambley was adjudged to have fouled an opponent as he attempted to run the ball out of play five minutes before the interval. Full back Dan Stocker duly despatched the spot kick into the back of the net. Town’s hopes to getting back in the game were looking slim, especially as they had suffered the loss of goal machine James Wroot after half an hour with a hamstring problem. That, and the survival of the penalty scare, helped the Yorkshiremen to grow in confidence. Still smarting from the December reverse at Skegness they increased their lead through Andrew Horbury in the 54th minute. The Lilywhites, who were carrying a number of injuries, continued to struggle. They appeared to be off the pace and created very little in terms of chances. Their misery was complete in the last minute when home substitute Benjamin Burnett notched the third goal. Club physio Arun Gray is expected to be a busy man as he attempts to get the Skegness players fit for the trip to Swallownest on Saturday (KO 3pm). On Tuesday the Lilywhites are on their travels again when they make their third attempt to play their league cup third round tie at Selby Town (KO 7.45pm). TOWN: J. Lambley, L. Lambley, Morrall, Fields, Evison, Parish, Norburn, Sibbick, Ford, Britton, Morrall, Wroot, H. Bunce, Warren.